I keep on finding things that I’ve not quite finished, don’t I – and in some cases I had completely forgotten about them. Like this one. I know it was a kit – stranded cotton worked in half-cross stitch on canvas, – but I don’t know why I bought it. And I clearly had something in mind for it, because I have attached it to a cotton furnishing fabric. Equally clearly, it wasn’t going to be a cushion centre, or I would have centred it on the fabric. 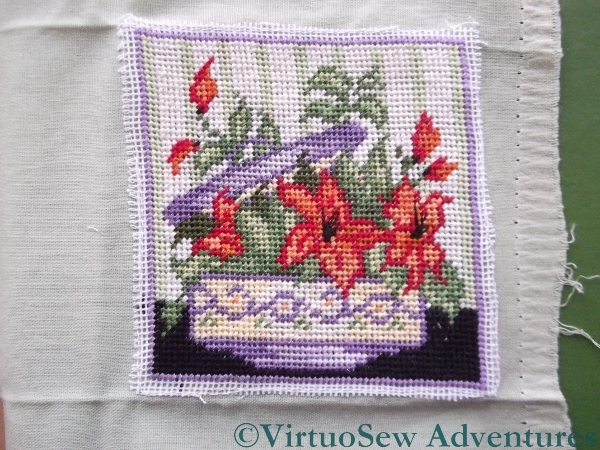 It is only about three inches square, so I suspect I had in mind making it into a needlecase. But before I do anything else with it, I have to find some way of covering those raw edges of canvas with something that looks deliberate! In other news, though – I’ve finished the second Crane! Actually, you may recall that it was the first, but I decided it looked too overheated in the pot it was destined for, and set it aside for another version. I will probably mount it on a circle of card, and put in that famed Winter Decoration corner. At least I know what I’m going to do with this one! The needlecase – I think you did mean to make a needlecase, though I don’t think you actually bought it! Presumably it would need a back page, probably felt. Cut a piece twice as long as the size of the back, and make a picture frame in one half of it, if you know what I mean. I like that crane a lot. how about a simple bound edge? a complimentary colour of bias binding…. I might use seam binding folded over the edge. Once it was attached do some embroidery stitches on top of it to decorate it a bit. I don’t know how that would work if the edges are meant to be folded over though. Plastic canvas needlebook with an aperture in the front for the picture? I do that all the time. I like the variegated thread on the crane, but what project is that? Oh how glad I am to know I am not the only one to forget some of my projects. When I moved from the mainland I had a whole bundle of these things. I was so embaressed about them that I donated them to the Guild sale table. They all disappeared and no one asked any questeions. I like your choice of thread for the crane. I think I’d do what Janice suggests, as binding would be pretty tricky and I think a solid edge of thread would be more sympathetic than fabric.. I’d forgotten the crane too! I really do love that thread. The little flower picture would make a good needle case. As your Mam suggested, cut the felt big enough for front and back, then precise close blanket stitch round the flowers onto the felt. Or if you didn’t want another needlecase, incorporate the embroidery onto a fabric book cover : a book to keep what flowers to plant next! Good luck! how about cutting it out and binding the edges with binding tape? You could also cut it neatly and add a chunky kumihimo cord over the edges, or ribbon. I often come across projects I’d forgotten about, I tend to put them back where I found them! I don’t know why my Feedly says you are listed, but your posts don’t show up! I have the same problem with another blog that I enjoy. Off to see if I can make it work this time. It’s very cute – and will make a lovely needle-case. I sometimes stumble across things like that – I call them “true mystery projects”… sometimes my memory jogs and it all comes back to me, but other times – well, other times it just stays a mystery! I’d bind it with a bias binding too, I think. The question is, do you still like it enough to finish it off?! However you finish it… those potted flowers are going to be lovely. 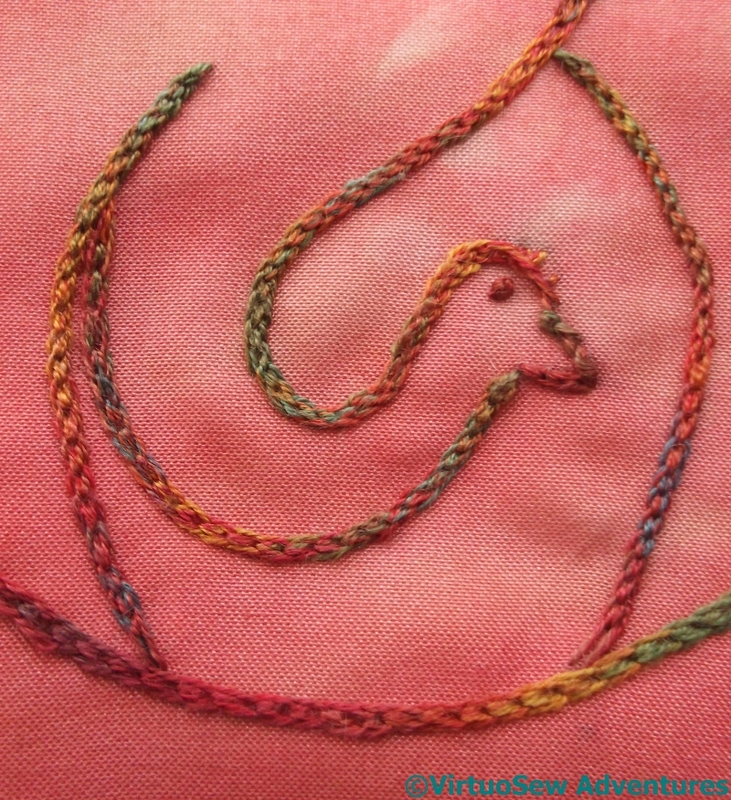 I like the variegated thread you used for the crane. And thank you for linking up your cat stitchery to Monday’s Stitchery Link Party. It’s sweet!